But seriously, you guys, it’s so so so good. There is no other name for this besides OUR FAVORITE coconut oil granola. My favorite, Bjork’s favorite, my friends’ favorite, our neighbors’ favorite. It makes the house smell like cinnamon heaven, and it elicits compliments from spouses like whoa, and it makes breakfast enough of an event to wake up at First Alarm. FIRST ALARM, guys. Not that I’d ever snooze or anything, but just saying, for those of you who do. Ahem. At the cabin in the summer, when my parents make the world’s largest batch of granola and we all sit out on the dock with sweatshirts and coffee and little bowls of fresh raspberries and granola and watch the sun rise over the lake. SUMMER COME BAAAACK. Around Christmas time, when I’m trying to figure out what to give my neighbors and friends, and large batches of granola in jars with a ribbon around the top are suddenly the cutest, most giftable thing ever. I feel like the three times a year granola pattern is about to change. Would daily granola snackage be too much to ask for? During my 60 day sugar free challenge, I’ve tried to stay away from baking because it’s usually just a set up for something that used to be really good to become really, really bad (unsweetened quinoa cake). –> See Fails. But granola is one of those things that makes me feel cozy, like I’m baking something sweet and yummy, even though it’s mostly like baking marathon runner’s health food. So when the feeling strikes and I need to get out the mixing bowls and lick something delicious off wooden spoons, granola it is. I originally made this recipe on a whim: late night, watching State of Affairs on Hulu, needing a snack. What else is new tho? It was completely without a recipe, just sort of eyeballing the measurements, thinking we’d end up with something good enough to eat over yogurt and fruit. Uhmmm yeah. It was absolutely the best granola I had ever made, and of course, OF COURSE, I hadn’t measured one single thing. Over the course of the next 587 granola batches, I tried to recreate the not-measured recipe, and oh happiest day! I think I’ve finally gotten it. I rarely “develop recipes” where I make them a bajillion times to get them just right – I’m the type of person who would rather scrap the whole thing after two tries rather than continue perfecting a recipe. I think they call it the opposite of patient? I’ve been this way for some time now. But this coconut oil granola was worth fighting for as evidenced by the year’s worth of various batches of granola we have sitting in jars in our cabinets right now. Which is sort of the best thing ever. At the risk of being annoying and saying the same things forever, this is OUR FAVORITE coconut oil granola. When you make it, it’ll be like we’re eating breakfast together because that’s how much we love it. Or wait, does that make it better or worse? Happy weekend, all you granola-ers! This Coconut Oil Granola is our ULTIMATE FAVORITE recipe! Made with pecans, pistachios, golden raisins, honey, oats, and coconut oil. Preheat the oven to 250 degrees. Mix all the dry ingredients together (except the raisins – set aside for later). Whisk the wet ingredients until smooth. 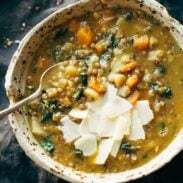 Combine the wet and the dry ingredients in a large bowl until the mixture is moistened. Spread the mixture on the baking sheet in a thin layer (use two pans if necessary – I just use one 10×15 jelly roll pan). Bake for one hour, stirring every 20 minutes. During the last 20 minutes of baking, stir in the golden raisins. When you remove the granola from the oven at the end, don’t stir it right away – the granola will form crunchy clusters as it cools. Yum! To ensure clustering, use 1 cup coconut oil and 1/4 cup honey. The more sticky the mixture, the more clustering will happen. I made a few batches on parchment paper but I didn’t like how those turned out with the oil sort of absorbing into the paper. If you have a nonstick baking sheet, I’d recommend going without parchment paper. This recipe is not as good when you reduce the coconut oil. I tried making this recipe with about 1/2 cup coconut oil and it seemed really dry to me. Be careful with the nuts! If you pulse them in a food processor and they get too fine, they’ll make the granola dry because it almost acts like a flour. I recommend just roughly chopping or barely running them through your processor. That is way too weird. I posted our favorite granola recipe today as well. Granola must be in the air. This is the first time I have ever seen flour in granola. Since all of your recipes are so well-conceived there must be a reason for this addition. What was your thought process and how does it affect the final result? This looks absolutely delicious! Hi Sally, I used the flour to help create little clusters. They make everything stick together a little more which I liked because I like those clustery pieces! Can we sub with coconut flour? Wow! Your pictures are really inspiring! I want to go in my kitchen and make this for breakfast! That picture with the granola on the stove with flowers, curtain and 2 blue chairs in the background ~ seriously marvelous. Speaking about serious, granola can get really expensive when you buy it. Honestly, I’ve never made it before, but just the thought of all the cinnamon goodness wafting out of my kitchen, consider the arm twisted. Thanks Laura! Appreciate that! 🙂 And totally believe the stats on that one! Hi, Em! White or whole wheat flour should work in this recipe. As for chia seeds, you could leave them out and still get a great result. If you feel that you want to substitute something else in, I would suggest another type of nut or seed. YES!! I feel like coconut oil is one of the secrets to nice, clumpy granola. I bet your addition of flour here helps with that, too … My husband is a granola freak (he eats greek yogurt and granola every day or his head will explode), so I’ll have to try this one out for him FOR SURE. 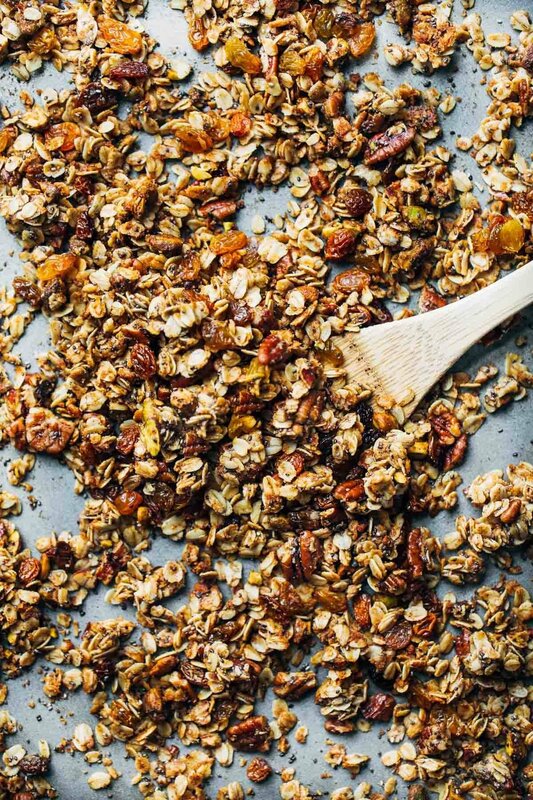 Love a good granola recipe that doesn’t include a ton of (bad!) oil! Yesterday, I bought 500ml of coconut oil to make my favorite lavender-coconut-lemon-body- scrub, but now I am left with so much oil, which I’ve basically never used for anything else but making peelings! Luckily, I recently discovered your blog as you just solved my dilemma by presenting me with a delicious opportunity to combine my love for granola and backing while making use of the leftover oil. Thank you for this wonderful inspiration! You mentioned cinnamon, but I don’t see any listed in the ingredients…??? Sorry about that! Should be updated. Oh, do I love how your mind works! I just bought more coconut oil when I didn’t realize I had a half a jar still around, and now was thinking of a granola-filled weekend. I’m curious behind the flour addition – can you explain the science? Crunchier/more clumpy/etc?? Looks so yummy! Seriously, so much texture. I think I need a break from my crock-pot oatmeal-quinoa mush. This would be the perfect substitute! Goodness this post is oozing with beauty and deliciousness! Annnnnd now you’ve convinced me to make my own granola. Totally a good thing to be eating breakfast together! But, you know me, that’s just my stalker tendencies kickin’ in. 😉 Cheers to sharing some granola ‘together’! I rarely measure ingredients for granola. Sometimes its great others not as much. Pistachios always make a granola for me. It doesn’t happen often but when it does I am in heaven. 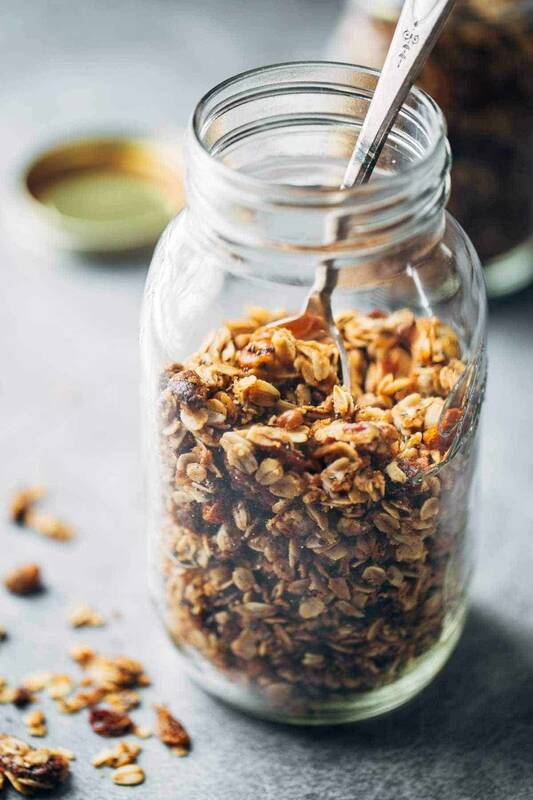 We love the ingredients of this recipe; in the past we’ve had bad luck with home-made granola being too hard and dry. we will give this a shot and tell you how it goes! This is the first entry of your blog that I read out loud to my husband–he wants you to know he thinks you are a poet! Your image in words of eating granola at the lake IS pure poetry! Hope you are enjoying your new kitchen! Just realized I pin almost every single one of your recipes! Ha! Thanks for the inspiration! Hey Lindsay! My hubby found your blog and he has created a monster! 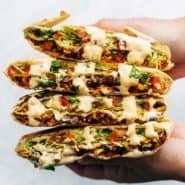 I have pinned so many of your recipes, and I’m on day one of discovery. I LOVE how you put the nutritional facts (saves putting it in my fitness pal) at the end of the recipe…The only thing I struggle with is I xan’t find the serving size for some. I see you put in grams on some (not sure how that translates to cups, but hey, something to learn), but some don’t have any (like the granola). Thanks for the yummy recipes! The veggie enchilada was a MAJOR hit at our birthday party! Hi Jennifer, great question! If the nutrition facts do not state a specific serving size, you can just check at the top of the recipe, where it says how many servings the recipe makes. (Ex: if a recipe makes 6 servings, separate it out into 6 equal portions, and each of those will be one serving for the nutrition facts) Thanks for the comment! Like you, I didn’t think that I was a granola girl either (and I’m a vegan, I’m supposed to live on the stuff), until I made my own. It must be that the store bought kind is just so darn sweet, and hard enough to break a tooth. This looks like a great recipe, I’ll have to try it, only substitute the honey for maple syrup. Thanks Lindsay! Yes! Another way to use my Costco tub of coconut oil. This looks wonderful and every time I see your kitchen, I’m outstanded at how gorgeous it is! yes!!! i can do 8.1g of sugar!!! thank youuuu cant wait to try it! I also wonder about the flour. For some reason, it makes me need an immediate nap. Could I use coconut flour? What do you think would be a good amount? I am not very good at using it yet. a little seems to go a loooooong way. Thanks.